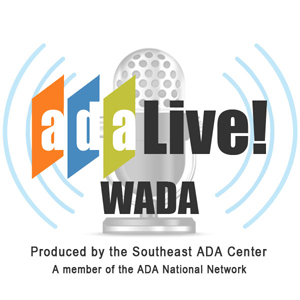 The Southeast ADA Center will present “Web Accessibility in a Nutshell” as part of its ADA Live! Podcast Wednesday, Feb. 6. The Southeast ADA Center, a project of the Burton Blatt Institute (BBI) at Syracuse University broadcasts the free online program, which focuses on the rights and responsibilities under the Americans with Disabilities Act (ADA). The program airs for 30-45 minutes on the first Wednesday of each month and is also available as a podcast on SoundCloud. “Web Accessibility in a Nutshell” can be heard Wednesday, Feb. 6, from 1–1:30 p.m. [Eastern]. It will highlight the basics of web accessibility, including why it is important, the ADA and other laws, the Web Content Accessibility Guidelines (WCAG) and common barriers to web access. Discover some tips and best practices to help you get started in providing more accessible and usable web applications and digital materials to a diverse audience. The podcast can be heard at SoundCloud ADA Live! and Facebook: Southeast ADA Center. Captioning in Zoom on February 6 for ADA Live! Episode 65 will be available. Learn more at the website www.adalive.org. No registration is required. Listeners can submit questions, explore resources and the complete program schedule and connect to archived shows on https://www.adalive.org/ or download podcasts from soundcloud.com/adalive.